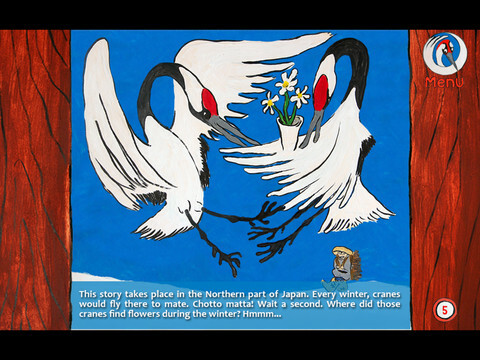 Before there were iPads or computers, before DVDs and even VHS tapes, there was the Japanese art of storytelling called kamishibai – which translates into “paper drama”. The art originated among 12th century monks but didn’t become popular until the early- to mid-20th century. Storytellers would travel the city by bike, telling stories from wooden theaters attached to the back of the bike., with each scene of the story was illustrated on wooden panels. 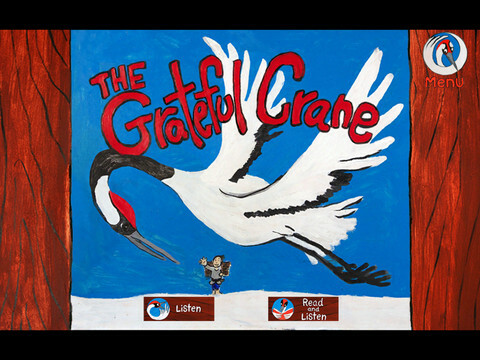 The Grateful Crane draws inspiration from both kamishibai and ancient Japanese folklore. 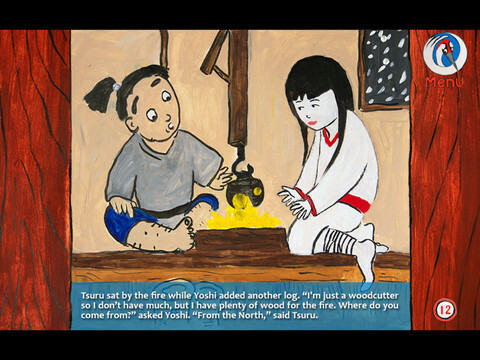 As the story goes, a young woodcutter – Yoshi- saves a crane with her leg entangled in a trap. Mysteriously a young woman – Tsuru – shows up at his door and he extends his hospitality to be rewarded in kind. Slowly the pair settle into a comfortable life together. Tsuru reveals that to return the Yoshi’s good will she wants to weave beautiful fabric, but warns that he must never enter the shed when she’s hard at work. When Yoshi sees what Tsuru created he takes her to the big city to sell the fabric, and this is where the story introduces some modern luxuries. I won’t spoil it for you, but this updated folk tale will not disappoint tech-savvy kids. Illustrations are virtual wooden story boards and the art is quite accurate. The iPad makes interactivity possible, something that the kamishibai men couldn’t do. Two different modes let players listen without reading or reading along with the narration. Turning pages is as easy as swiping, and a menu button lets players skip around from page to page. The only downside is that the price of $3.99 is a little steep considering that similarly priced storybook apps generally have a game or two to go along with the reading. That said, my children (3 & 5) loved this story. I think they may have assumed that this story was going to be, well, boring, but the modern twists kept them engaged and they even startled giggling. They played through the story several times independently as well.